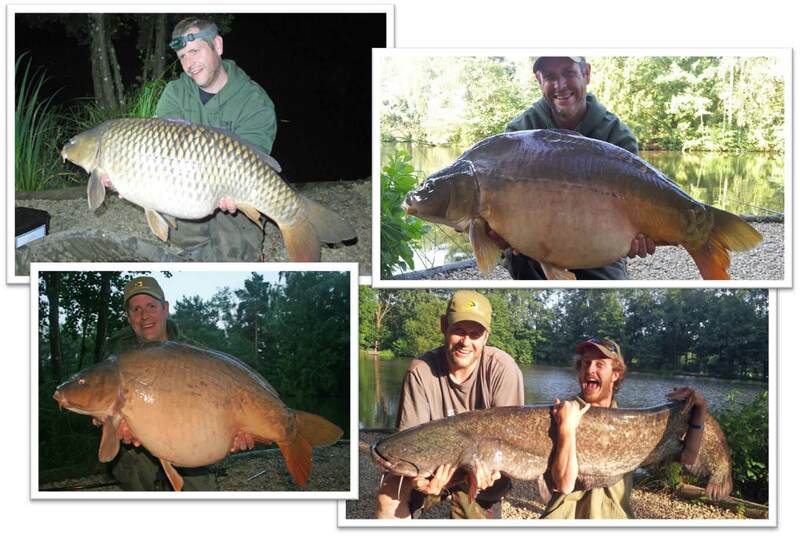 For all carp anglers, their first carp fishing trip to France is a big thing. 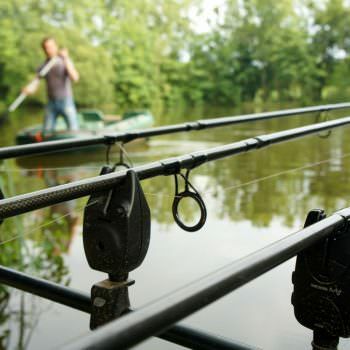 You’ll spend months dreaming about it and preparing rigs, bait and tackle but how do you go about making the trip a success when you get there? 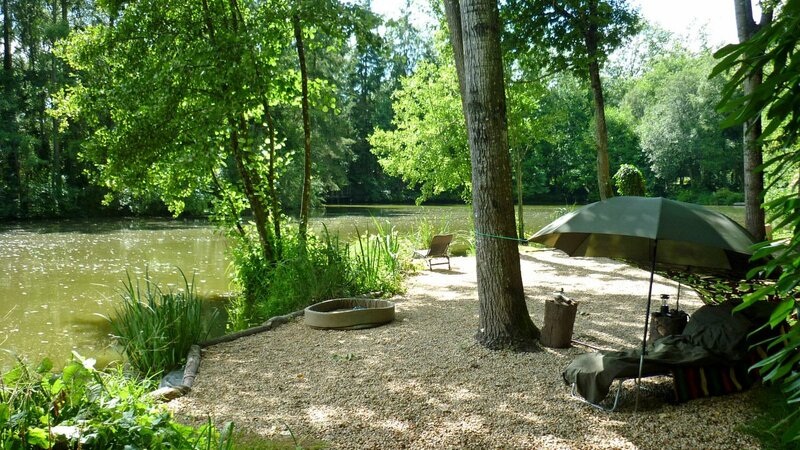 I’ve written a series on planning your first fishing trip to France but here, I want to talk about a key tip and one key principle when you get to a new venue which James put into practice beautifully: trust the local knowledge. Now before you jump to the conclusion that this is just another blog article about how great an angler I am, you’re wrong. Why? Because I’m not! I don’t have the breadth of experience for a start. 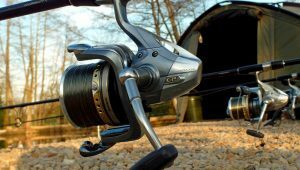 But based on my own fishing experience at Beausoleil so far (80 nights and counting) and the reports and information from the hundred or so anglers I meet each year, I do know one of two things about how to fish Beausoleil! This is an excellent result for an individual angler at Beausoleil, never mind one for his first trip to France! So, what tactics did James use? James was based in the Point Swims which gave him plenty of water to target. Baits were positioned as far apart as possible and covered different areas of the lake. One rod concentrated on the snake bank margin, the other the island margin and the other one focused on the aerator. 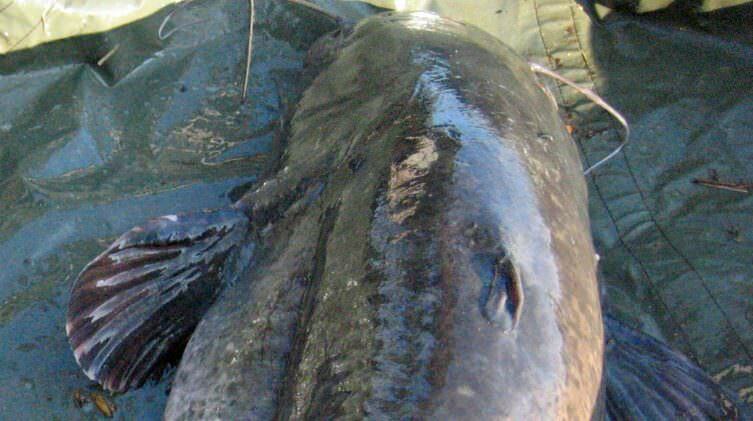 This spread his angling footprint over some 100 yards of water and every rod produced! This approach is made much easier by using individual bank sticks. 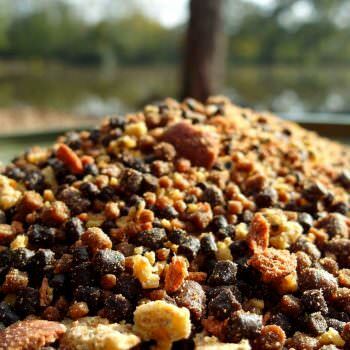 Baiting strategy was kept simple and light with a mix of boilies, pellets and chops. 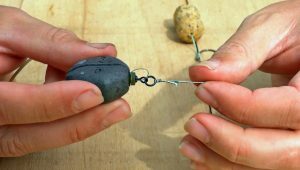 No more than two handfuls were ever placed over each rod and spots were moved if they didn’t produce. 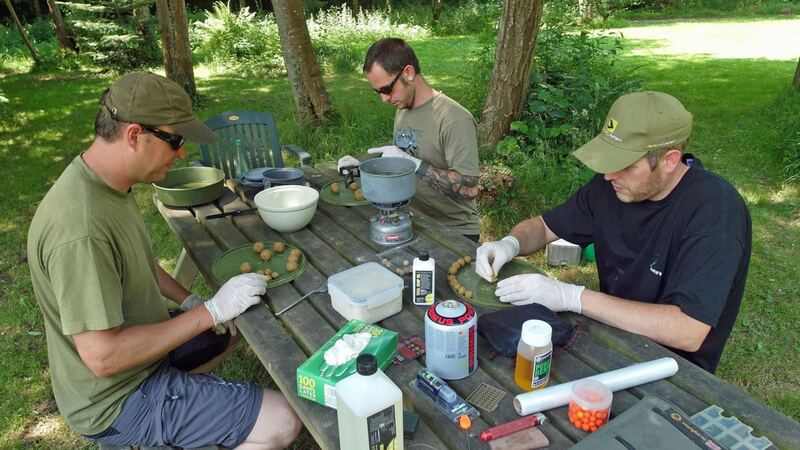 James made 4kg of home-made Blue Oyster boilies and 10kg of pellet last the entire week and never ran the risk of killing a spot by applying more bait to an unproductive mark. 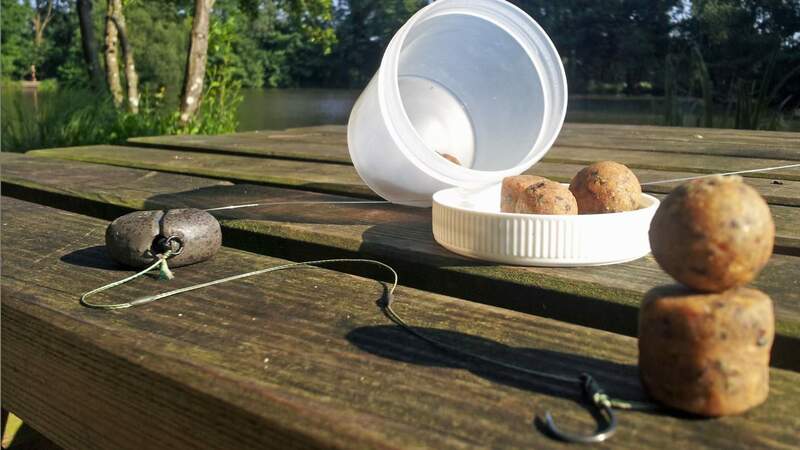 Bait choice was simple and James fished the 22mm Blue Oyster all week. 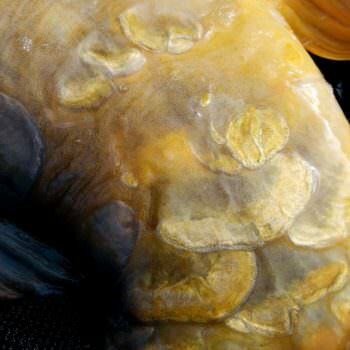 The bait worked well for both carp and cats. Rig choice was also simple and James used the Beausoleil universal carp and catfish rig all week long. 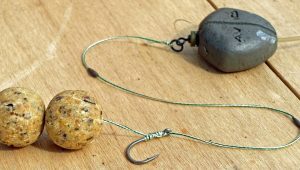 If you don’t know it, it’s a trick version of a standard braided rig. Hooks were kept razor sharp and tipped with Vaseline to prevent rust. Lines were meticulously sunk and fished very slack. 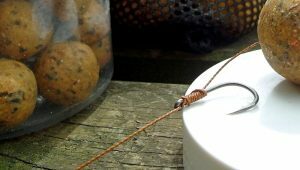 Clutches were set quite tight: not tight enough so that the rod could go in but tight enough to make a massive difference to the quality of the hook hold. James also paid a great deal of attention to his mainline and hook links and regularly checked for damage and cut back anything he wasn’t 100% confident in. James also applied his watercraft skills and kept a very close eye on the water and walked the lake regularly looking for carpy signs. Rigs were moved based on this and he caught from spots that I didn’t show him. James rested his spots during the times when bites looked exceptionally hard to get but got his baits in place well before bite time approached. I’ve seen several clients already excel at this tricky skill of being there for bite time. I wouldn’t have done anything different if I’d been fishing there myself! It was a pleasure to meet James, I’m very honoured that he had the faith to be guided by me and once I’d pointed him in the right direction there was no stopping him! James headed home with three new PB’s and memories that will last a lifetime. 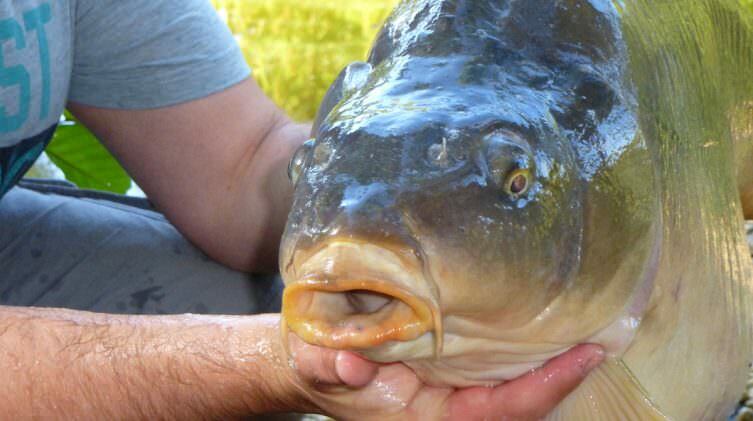 That’s the magic of carp fishing in France. It provides the potential, all you have to do is get your approach right, and he certainly did that. Well done mate, pleasure to fish with you!